why can’t all manhole covers look like this? In Japan they are! Every manhole cover is uniquely decorated, sometimes even colorful. Often a city or certain part of a city has a theme of what they will look like, but all are beautiful. I took many pictures of them. Beauty is all around us if we take the time to look. Sweet indeed! Along with alot of peeps, I just found your site via Yahoo News! Wow, what an adventure! I also went to your NY walkin’ site and I have decided that you are just crazy, but in a good way! :) Did I read on one of the posts that “Mom” also has a blog? If so, and someone knows where it is, please post a link. I’m thinking “Mom’s” blog has to be pretty entertaining as well. Best of luck in your travels. I look forward to exploring America through your eyes…..
You should start at the very beginning from Day 1. It took me a few days to catch up, but now I feel like I’m walking right behind Matt….just a few steps behind. What fun! I intend to, but so far I’ve kinda been skipping around. I will start at the beginning….AFTER I get off work, LOL. I can’t wait until he gets into S. Dakota, MT and the western states. I can already imagine the beautiful pictures he will post. Be ready for several hours of reading enjoyment! I made the mistake of not logging in for a couple of weeks and missing out on all the fun, so make sure you check it daily! 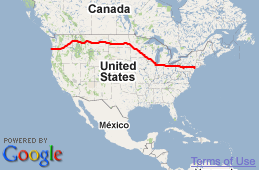 I also am looking forward to seeing the picturs from N. or S. Dakota which ever route Matt takes. I’ve been across N.& S. Dakota but always on the interstate. This is a whole different perspective.Matt I envy you. Keep up the progress. Hey, I’m all for beauty and that manhole cover is indeed beautiful. Heck, it even has such detail that it could pass for the engraving in a coin. But on the other side of the “coin” (excuse the pun) :) this is probably one small part of the puzzle on why our cities, states, and nation is going broke. Beautiful yes, but first I’d like to know exactly what this manhole sewer cover cost in the amount of taxes expended and what a normal checkered manhole sewer cover would cost. Thanks for the picture! Who can put a price on functional beauty? Forgive me if I’m wrong, but why would it be more expensive then any other manhole cover? I don’t know much about iron works, but it seems to me that once you make the cast (which I wouldn’t imagine to be any more expensive to make then any other checkered cast or NYC sewer cast)… then the cost of molding the cover in the casts would be not a penny more then usual. No? Most of the manhole covers in Minneapolis are normal. This one is on the Nicollet Mall, a pedestrian and public transit mall in downtown Minneapolis. We have lost so many arts and artisans. The days when this type of pride in one’s work are gone. This one is a beauty! One would think taking a manhole cover to a recycler is illegal. On a side note, the cover says Nicolett Mall…Is that a shopping mall where the cover is located? Nicollet Mall is basically a fancy name for Nicollet Avenue for about 15 blocks downtown. In the ’70s the city council wanted to make that stretch a pedestrian- and bike-friendly retail area, kind of like what they did in Boulder, CO. The street itself kind of meanders a bit (like the Mississippi which runs through the city), with broad sidewalks and lots of outside seating for bars and restaurants. It’s also a bus-only street (except for Thanksgiving Day, for no apparent reason). 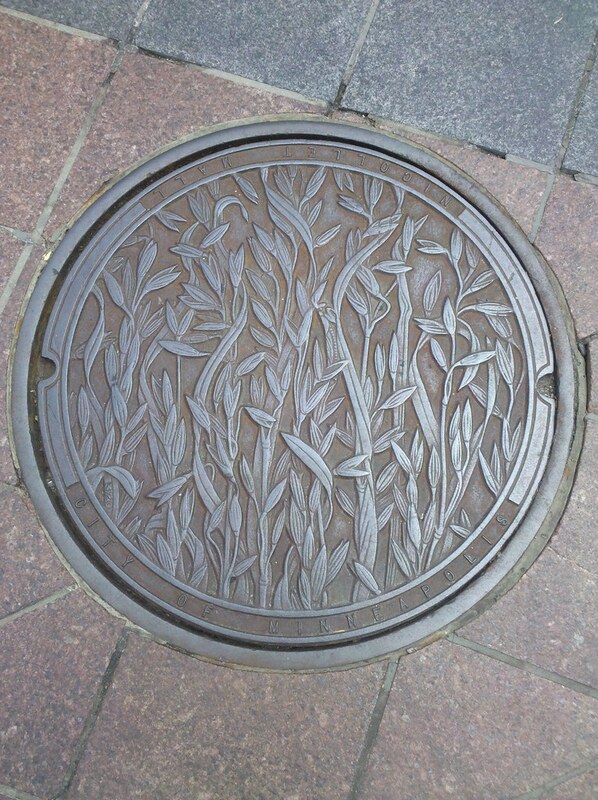 There are decorative manhole covers with various designs all over downtown. Relatively speaking, we have a lot of trees and public art here. When you’re stuck in the house during our long winters, it’s nice to see art when you can finally go out and enjoy the good weather. Edit: Emily answered my manhole cover location question. When I was walking I saw some really nice manhole covers. I imagined making a beautiful concrete floor with lots of manhole covers set into it like jewels…now I know where to get another one! Now that one is really a beauty,N.Y. could take some lessons here. Why aren’t more beautiful manhole covers made? They could do limited edition ones, like the state quarters. You have seen amazing sights all across the USA. Manhole Covers and Water Covers just happen to be my art theme. I create light weight sculptures that replicate street scenes with the covers in them. Please send me jpegs of your favorite covers on your next trip. Say hello on my website blog.